I love meals in bowls. Who doesn’t? Steaming plates of spaghetti bolognese, french onion soup with cheesy croutons, short soup of slippery wontons. As great as these dishes are, in my humble opinion the laksa is the reigning monarch of bowl food. My favourite laksa has everything. A complex base of chilli and shallots, fragrant with dried shrimp, lemongrass, citrus and other secret herbs and spices, tickling the tongue. Hot, silky broth, rich with stock and coconut milk. Slippery noodles. Spongy, toothsome tofu puffs, drenched with broth. A mixture of sweet prawns, tender thigh of chicken and perhaps the odd fish ball. Crispy, succulent bean sprouts. Vietnamese mint, otherwise known as ‘laksa leaf’. A sprinkle of fried shallots, crunchy, and sweet. A squeeze of sour lime. And last but not least, a dollop of pungent chilli and shrimp-paste sambal. I have loved many laksas. My all-time favourite laksa was from a short-lived Nonya kitchen in Redfern, located conveniently across the road from my workplace at the time. I don’t even know if it had a name. I don’t know what else was on the menu. But a man we knew as Ba-ba was the laksa master, serving up steaming bowls of the stuff for our lunching pleasure. Sadly he had to hang up his wok due to a repetitive strain injury caused by years of expertly handling the wok chan, and while the building now houses a cafe which, to the best of my knowledge, is run by the Serbian mafia, Ba-ba is still remembered and revered by my former colleagues. Moving to a new workplace in the city, I made it my business to find some new lucious laksas. The first, and my current favourite, is from Sayong Curry and Laksa in a dingy hole-in-the-ground below Woolworth’s on Park Street which I fondly refer to as The Secret Food Court. The highlight is the finishing touch of a spicy, smoky sambal. In the immortal words of Depeche Mode, I just can’t get enough. Also a favourite is Jimmy’s Recipe Malaysia in Tank Stream Way. Though I’ve never traveled in South-East Asia, there’s something that feels authentic about trying to find a stool in this hole-in-the-wall, slurping up your soup while knocking elbows with someone at the next table. Everyone seems to have a favourite laksa joint. My friend Sue the Cyclist recalls pilgrimages to the famed Malaya in Sydney, long before it moved to its fancy digs at King Street Wharf. She imagined a giant, bubbling laksa pot, like a master stock with a life of its own, to which the chefs would simply keep adding things, creating a broth of immense complexity and flavour. Indeed, the Malaya was the home of Sydney’s first legendary laksa. Perusing my collection of vintage food guides, I came across this decades-old review by irreverent food critic ‘Sam Orr’. The Malaya which is open for both lunch and dinner seven days a week specialises in a small section of its menu at the back of the huge Chinese section in Malay-Indonesian food. The sates are no great shakes here but all the curries and the laksas as well as the Singapore noodles have always been quite brilliant. The place always has been very cheap and the cheapness has survived the move from lino to carpet, from unlicensed to licensed (although you can only get the export style beer in small bottles there). To my mind it has always been one of the best values around in Sydney. The staff are generally engagingly rude, not only to the red-faced European scum but to their own kind as well – which shows a nice impartiality. It takes a fair bit of retaliation to be thrown out of the Malaya, but I managed it one time along with a couple of pseudo-literary types. Don’t try the Chinese section of the menu, it will nearly kill you. Say about $8 to $10 for two. Alas. Not a laksa is to be found in my new country home. That is, unless you make it yourself. I was inspired by a recent invitation to a Nonya cooking class held by Victors Food. Being as it was in Sydney, I unfortunately couldn’t make it, but they were kind enough to send me the recipes so I could have a crack at home. While my laksa wasn’t up to the standard of the experts, it more than fulfilled my craving, utilising some beautiful local seafood including Yamba prawns fresh from the previous night’s catch. These were, without a doubt, the best prawns I have ever eaten, fresher and tastier than prawns straight from the tank at the Golden Century, perhaps due to their higher content of will to live. 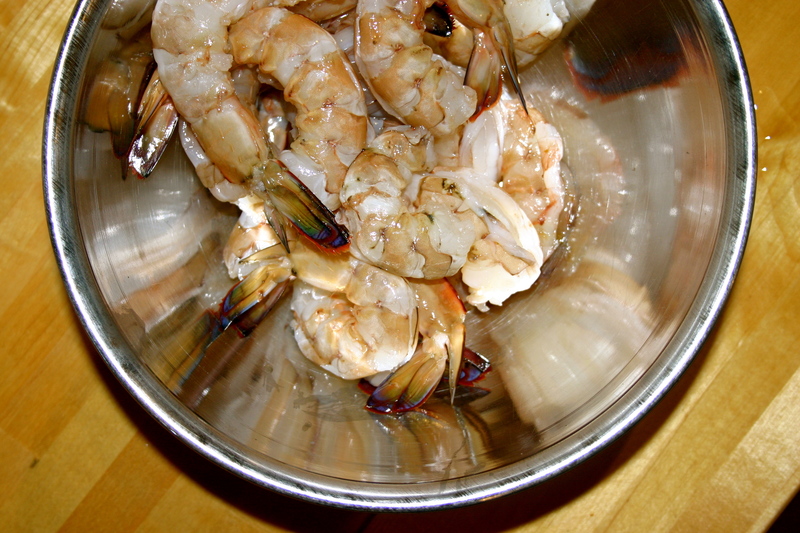 Prepare the seafood, peeling the prawns, leaving tails intact and removing the intestinal tracts, and dicing the fish into bite-size chunks. Season and gently fry in 1 tbsp of the oil. Set aside. Heat the laksa paste and add the stock. Allow soup to simmer slowly as you prepare the rest of the ingredients. Bring a saucepan of water to the boil and scald the noodles for a few minutes, then drain and set aside. Add the coconut milk to the simmering soup, allow it to heat through, adjust the seasoning and pour over the noodles and garnishes. In separate bowls, divide the noodles, top with seafood, bean sprouts, cucumber, herbs and fried shallots. Where is your favourite laksa??? Oh for a bowl of that Malaya laksa. It more than tickled the tongue, sometimes it numbed the lips too. Somewhere in the stock, the taste of cold tea. I would like to see those MasterChef contestants name the ingredients of that one. oooh, wish I was there to eat those divine prawns! Is laksa always made with chicken stock? Not always. In fact ideally I would have made a prawn stock to use in this one, though my prawns came sans heads so I couldn’t. If, for example, you were a newly converted vegan, I’m sure you could find a non-animal based alternative. Not in the secret food court though. Oi! Who showed you the secret food court! eh? You did Emma, YOU! Oh wise sage of Sydney noms. And you have too many commenters called Emma. This is the old one. Yum! 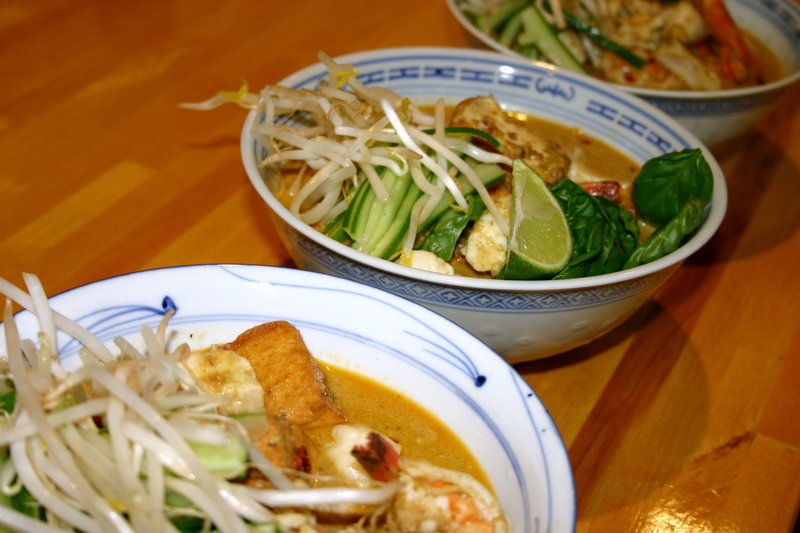 Personal fav is Penang Asam Laksa – no coconut milk, so the flavour is zippy and fresh. My favourite is Malay-Chinese takeaway. I like Malay-Chinese on Hunter too, for it’s no nonsense approach. I’m gonna dig out the secret food court though!